Before choosing a website template, you need to pay attention and think over your needs and requirements. It can be a bit difficult to choose, considering the wide range of website builder templates offered online nowadays. Surely, it is impossible to show them all in one article. 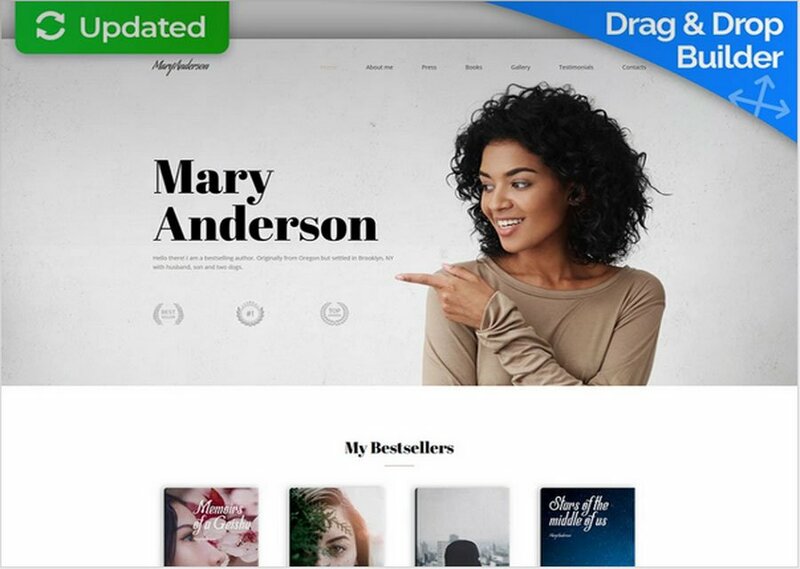 Still, here we highlight some of the best website builder templates from around the web. They are different from the point of design, but their common characteristic is full functionality. The list of topics they are devoted to includes e-commerce, photography, business, and industry. All of them have on thing in common though. 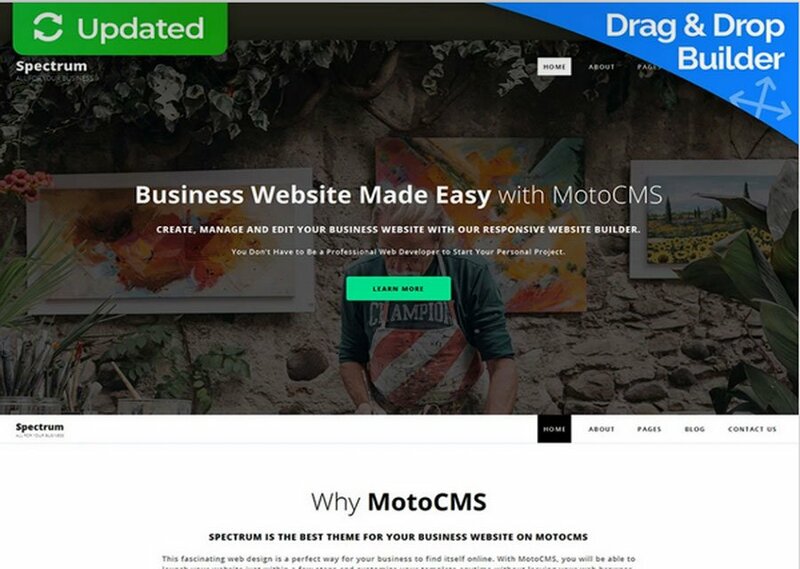 Each one is created for MotoCMS software, which is a revolutionary website builder tool! Website builder facilitates your work on launching and customizing a future site even if you have no experience coding. Dealing with it is comprehensive and convenient. So don’t waste your time and money resource on taking many difficult steps when you can start choosing a website builder template of your dreams! If you need a professional multi-page website with a great design, you should try this evolution universal theme. It is a multipurpose responsive website template, which lets even a dummy create their own website in a few hours. Special coding skills are not necessary, as the template has a built-in admin panel. Furthermore, plenty of tools and widgets are added to it. They help you edit your website design, manage social media, and also make a personal or corporate blog. This theme contains more than 16 ready-made pages that will cover all your needs without extra customization. This one is for book writers, both beginners, and experienced ones. If they are looking for a customizable bright theme, this website builder template is an excellent pick. The drag and drop builder minimizes your efforts in making and customizing the site. It is a strong advantage because it saves your time. Then you can spend it on writing a new masterpiece instead of trying to write a smooth code. The process of managing a ready-made site is also much easier. If you are not sure this template completely suits your creative flow and ideas, there is an extra feature of a free demo for 14 days. After that, you can buy a full version with all the changes made. This dramatic design is for NGOs which deal with the child charity. It is easily-manageable and user-friendly. 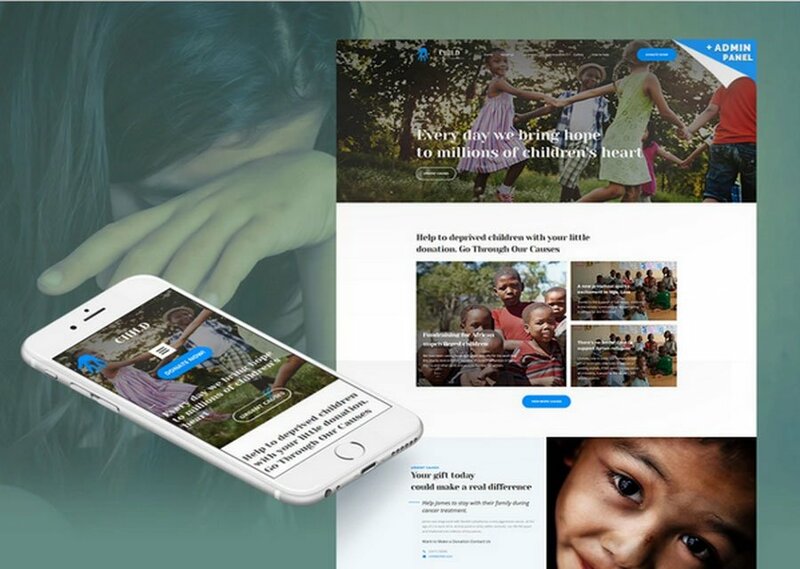 This easy website builder template for children’s charity has content blocks. Moving them, a user can create any design and layout to their liking. Actually, that’s the drag-and-drop builder which makes the process easier. Thought-provoking pictures and information elements show prospective visitors the whole situation of those in need. It also influences their feelings which can be a good motivation. 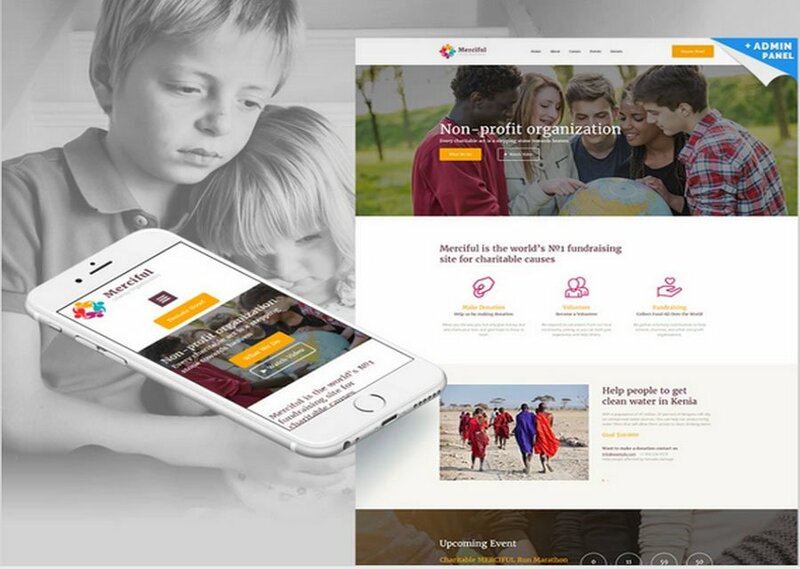 Its specific feature is a blog where NGO can share their aims and success stories. Finally, there is an opportunity to announce charity events at once. Social media widgets make the site more accessible for visitors. It also becomes more informative due to different types of data presented at various accounts of your company. What is a crucial need of the company in the modern business world? A qualified business site which fulfils all the sphere requirements. The design of this representative of website creator templates is a true masterpiece. Firstly, you can choose from 17 dedicated unique pages for a fully-functional website. There also 4 original child pages for restaurant and consulting businesses, with the addition of regular updates with more new child pages. A user-friendly admin panel can cut efforts taken for your website customization. A free trial period is also available for 2 weeks. Nowadays photography services market is competitive, so a professional needs to stand out. This aim one can achieve by creating a special and unique website. 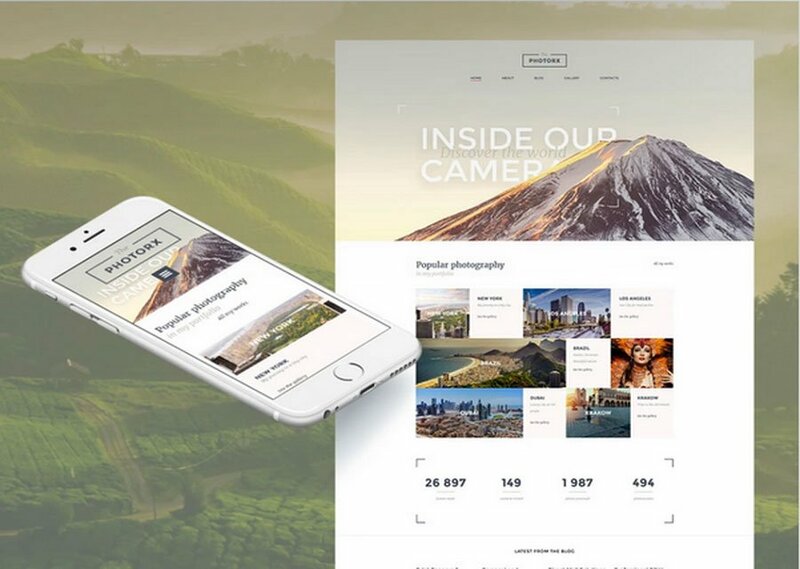 This is one of the best website builder templates devoted to photography which will raise the number of website visitors. Its characteristic features are fast work and usability of your website. 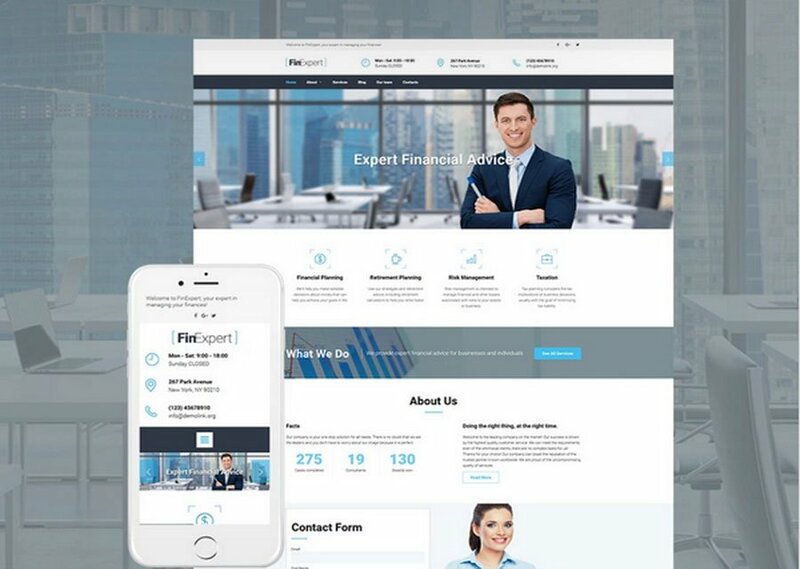 This one of the website builder templates is a great choice for financial advisors. It has a beautiful layout with thrilling widgets like social media, a mail chimp widget, special video widget, and various galleries. The professional Color Picker tool lets one tweak hues and colors of the whole website. The theme is responsive and works perfectly on all devices. 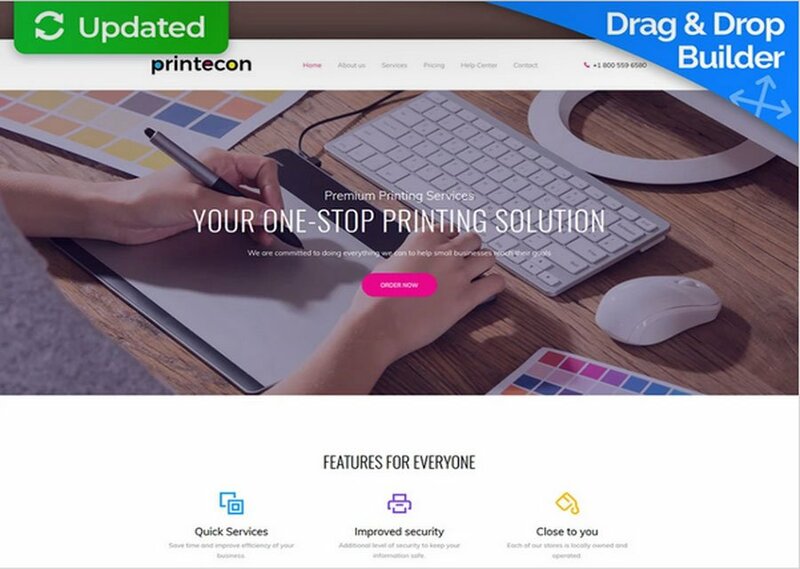 Template Printecon might be interesting for those who are looking for printing company responsive website templates. This one proves its premium quality. It means that Printecon contains all the elements necessary for starting a multi-page photography website in a couple of clicks. The drag-and-drop website creator is good for beginners because it improves the customization process. Choosing a color palette and organizing various content blocks becomes easier. This theme is packed with useful widgets and options for further web development. 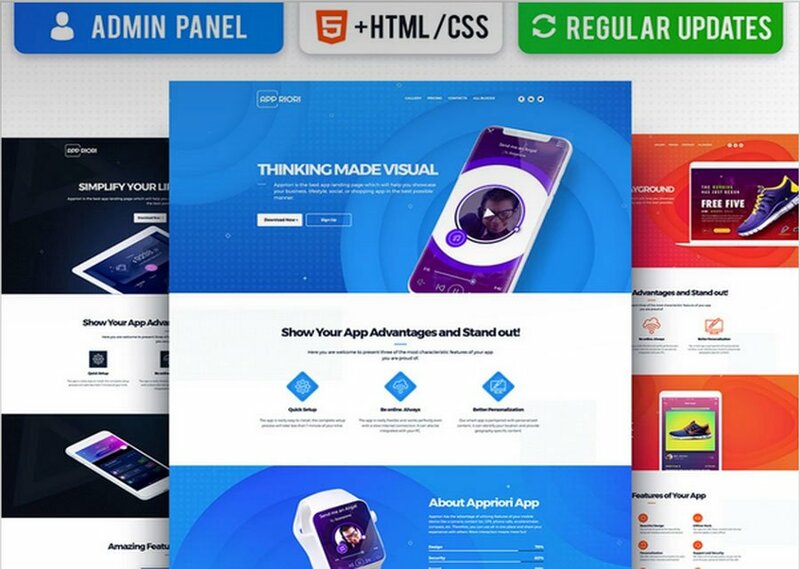 Being one of the best website builder templates, Skyline Top Website Template is the best choice for a person with no coding skills. With the help of its layout and design are customizable. Furthermore, this theme contains 20 ready-made pages with 4 extra pages: Skyline Black, Travel, House Construction, and Dentist page. A business blog functionality in the admin panel gives an opportunity to share needed data and the latest news. This top website template is available for 2-weeks free test with entire functionality. While it is more habitual to choose a template with all the bells and whistles, sometimes it is better to change it for simple. Defrozo is one of such simple and stylish website builder templates. It is perfect for beginners. the template has a ready-made crisp design in store, though you can personalize it as much as you want. The theme contains 4 made-up templates for each page. You can also incorporate a blog to post valuable articles on photography. With 100% responsiveness, you can show off your photographer portfolio on any devices without losing quality. Handy widgets for photographers included will help you reach top-level functionality of your site. 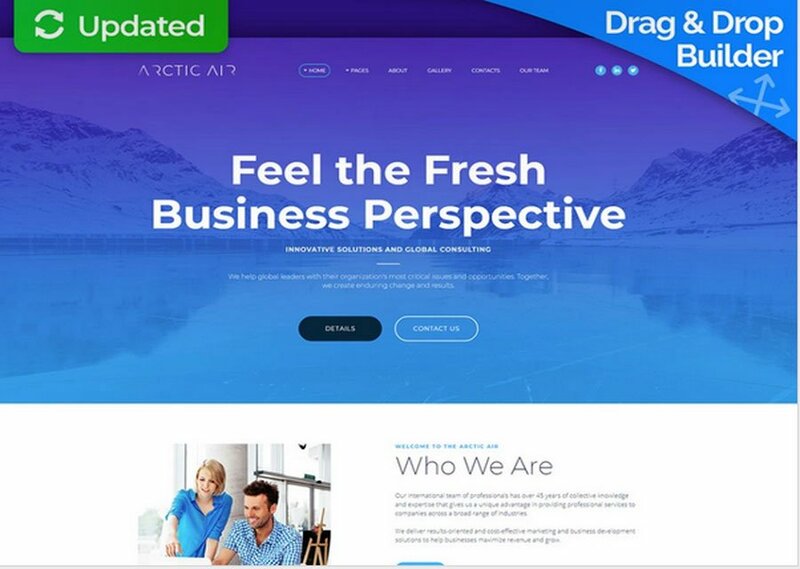 If you feel the need for one of the website creator templates with not only a flexible layout but also clear design, have a look at this one. This responsive, mobile-optimized, and SEO-friendly theme is ready out of the box. Moreover, there is a drag-and-drop editor which facilitates customizing your site fully. One can add social links to encourage visitors to engage with the content. Further, it transforms them into prospective clients of the start-up business. If you’re looking to bring your conference or a summit to the Internet, check out this template. It’s a feature-loaded, responsive theme that’s great for businesses, creatives, and bloggers. 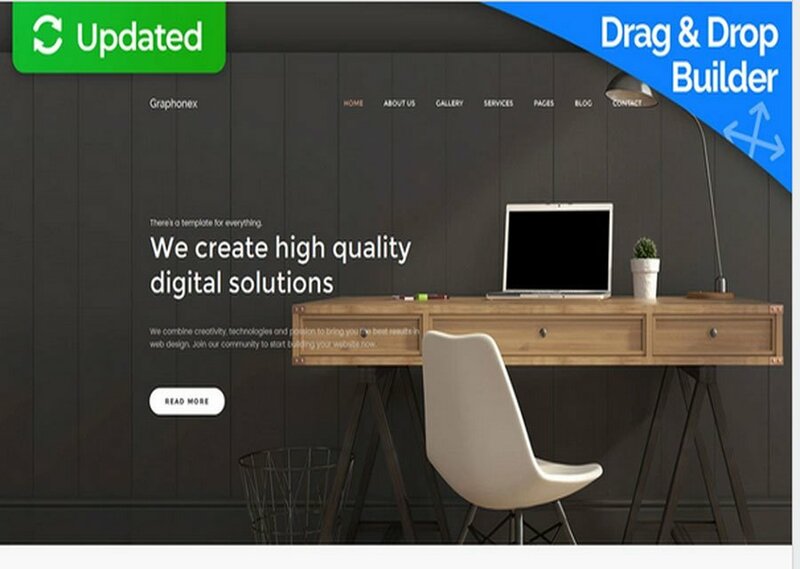 This template as all the rest of best website builder templates incorporates drag&drop builder. It enables assembling a functional website for your business. The template contains several ready-made blocks. Editing them doesn’t take much time, and all the changes are visible in real time. Every kind of pre-made page you may need for your site is already included in it. Professional widgets will allow you to write engaging posts before, during, and after your event. 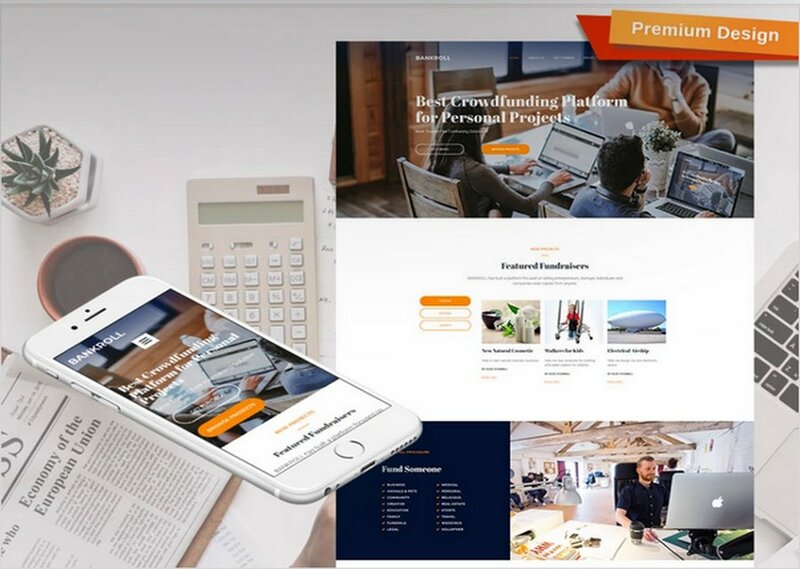 If you want to build a portfolio of a consulting company or a company site itself, you’ll want professional website creator templates to work with. That’s where Crowdfunding Template for Consulting Companies comes in. It offers a modern look for business owners and creatives. This template’s strongest feature is its integration with various widgets and modules. They include an audio player, a video widget, photo galleries, and also a color picker tool. They let you build an engaging and interactive site, representing all aspects of your consulting practice. Many people nowadays doubt on the crypto mining future, but the bravest ones make bitcoin community more influential in business. This community grows fast. 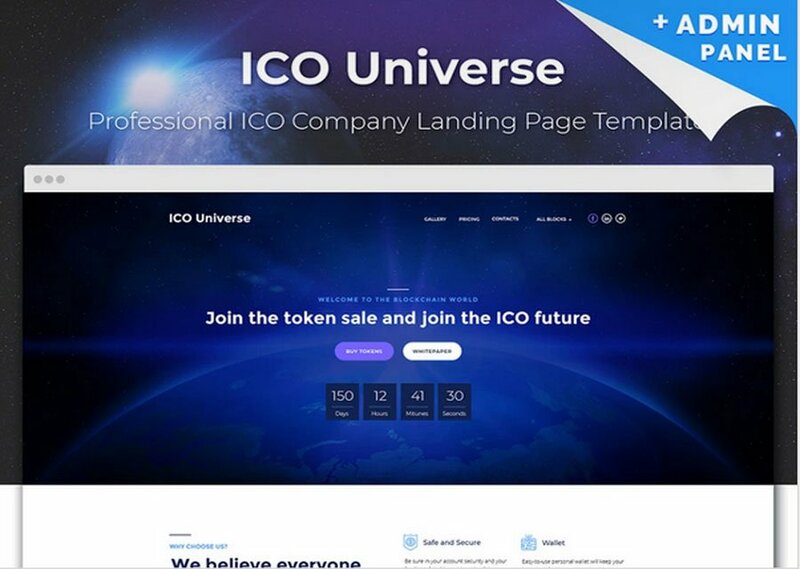 If ICO is for you, this one of the best website builder templates will suit you entirely. It is well-structured and modern. Its essential feature is simplicity, which comes from applying an included website-builder. That equals dragging and dropping designed blocks, customizing information, and images. 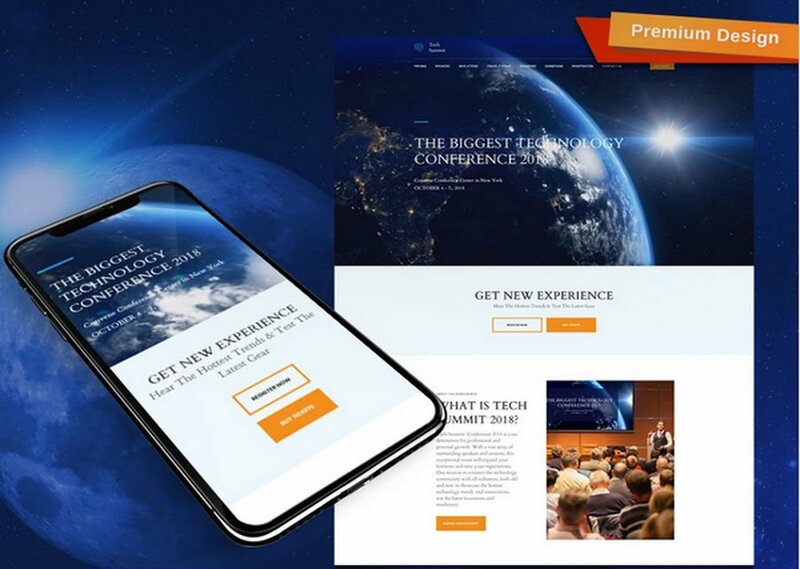 Being responsive, this landing page template will look perfect on any device. This template is an excellent choice for professionals that value their time. 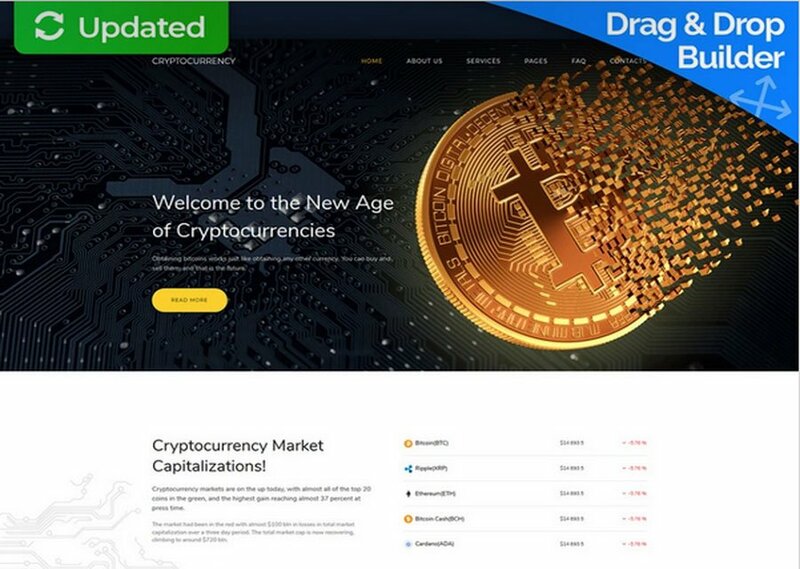 Due to the powerful drag-and-drop website builder, the process of managing a cryptocurrency website is easy. It means that moving content blocks on many pre-made pages is fast and simple. This premium template will attract bitcoin miners from all over the world. Furthermore, if you build a website with this template, your customers will be able to see them in full quality at all modern devices at ease. 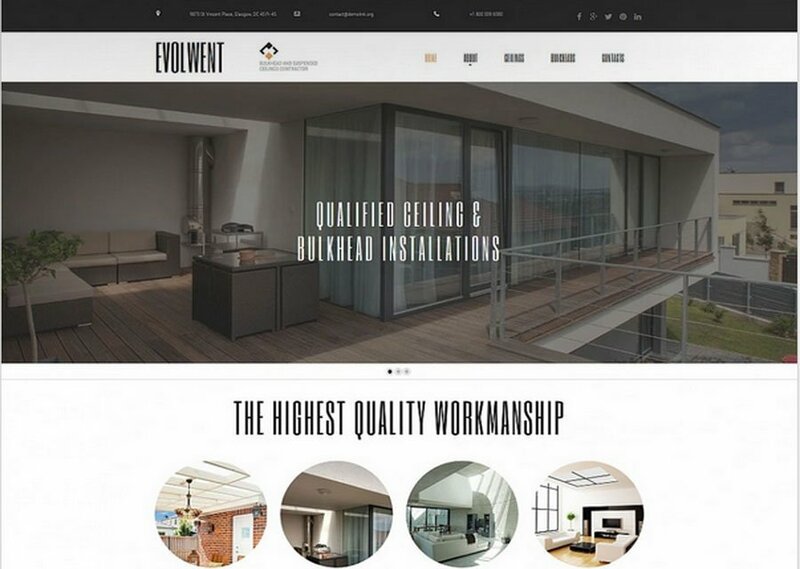 When creating a professional design website, a touch of elegance can be a nice choice. 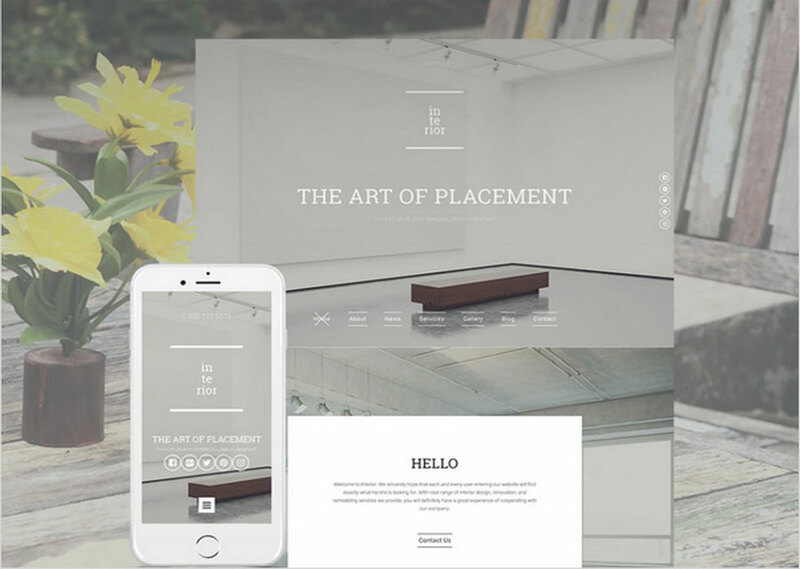 With this laconic template, you can create a fashionable website with a minimalist twist. It incorporates qualitative images and a variety of popular widgets, such as a social widget, contact form, different galleries, and also a video widget. Finally, you can enliven your website with creative ways of content representation. There is a carousel and responsive slider, and also a customizable audio player. It may add voice to your presentation at the site. All the best website builder templates of such a kind are SEO-friendly so they can enable getting higher ranking in SERP. Besides, Google Analytics integration lets you get statistics and traffic analysis. Both beginners and advanced users will appreciate the simplicity of customization of this theme. You can create any site kind of site with the help of it, whether you’re an individual financial advisor, an agency, or a blogger. It takes only a couple of days to launch a site using a website builder, and every element is customizable on the fly. Comprehensive tutorials inside the admin panel will explain to you how to work with every feature. SEO-integration will not only help search engines crawl your site efficiently. As a result, your site will rank better on search engine results pages. 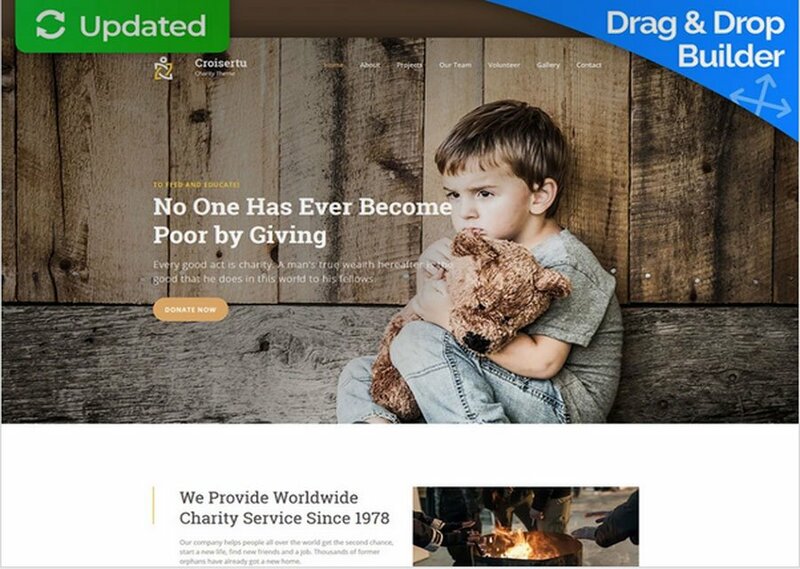 It is a free website template, which covers the needs of the organizations dealing with charity. This landing page template has stock photos included. Before trying it, there is an opportunity to watch a live demo. The other thing to do is to view the control panel which is understandable and intuitive. Such website template will please direct and purposeful entrepreneurs. It is for those who already have an idea on how to develop a startup business. This theme is one of those website creator templates which is completely responsive. It means that it preserves full quality at any size or resolution of the screen, including mobile phones, and tablets. You don’t need any specific programming skills to work with it. Use ready-made designed blocks and must-have widgets. The widgets contain the parallax effect, social integration, contact form, and a video widget. So, you can show information about your latest and greatest start-up projects to the prospective clients in any possible form. Appriori’s unique and multi-colored layout enables you to show off your latest app. An online presentation doesn’t need to be strict. 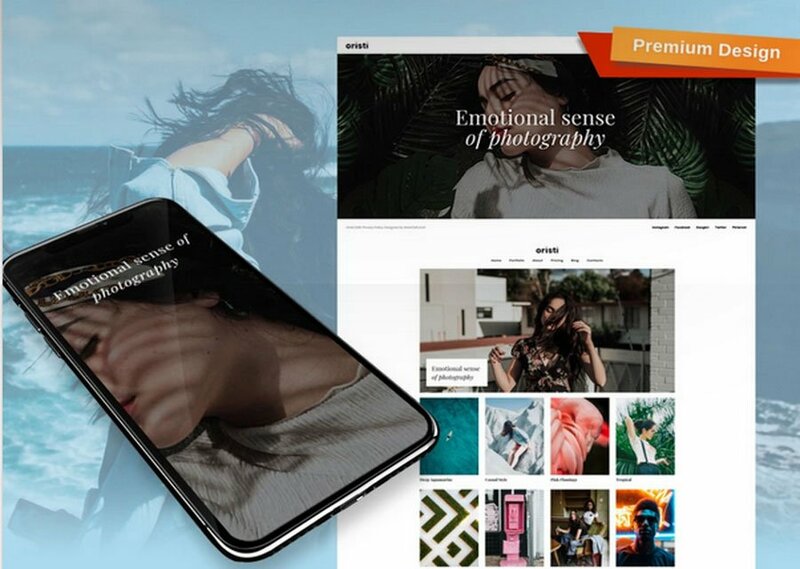 Instead, you can bring the focus to your creation with this landing page template that displays information and media in a stylish way. A website builder in Appriori gives you not only pre-designed pages, but also many options for customizing them. So, you are able to create a website to your liking. As the slogan “Reputation. Respect. Result” suggests, premium website theme for lawyers is efficient and attractive. It is aimed at law companies. Small businesses and big companies will appreciate its reserved design. You may notice couple of features that make it stand out. First of all, it includes the manageable admin panel as the best website builder templates. Panel’s most resultative tool is the Website Creator with the drag-and-drop functionality. 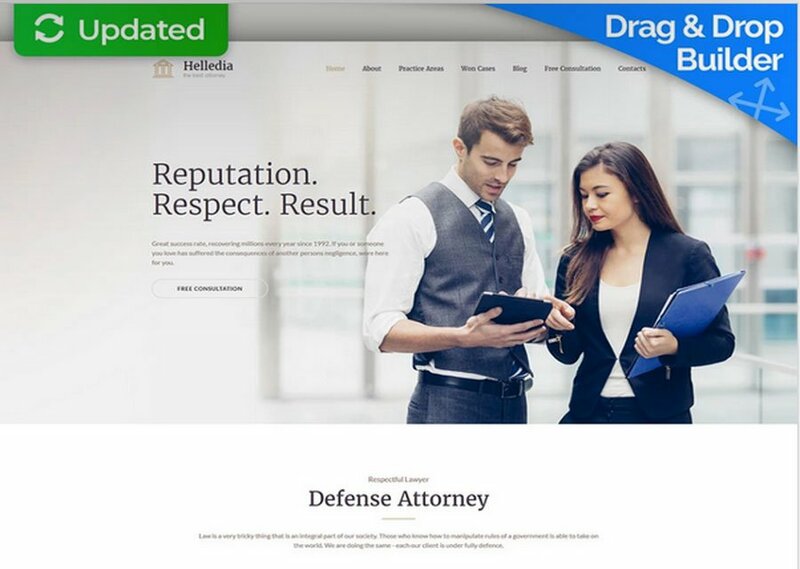 It is non-difficult to make a unique lawyer website by moving pre-made content blocks. Secondly, the website template contains eye-grabbing widgets. You have an opportunity to register for a free 14-day trial and test all features out. This is a free website template which enables you to create any website with no previous experience. Almost any non-profitable charity organization can benefit from it. This responsive, SEO-friendly, and mobile-optimized template is ready-to-use. 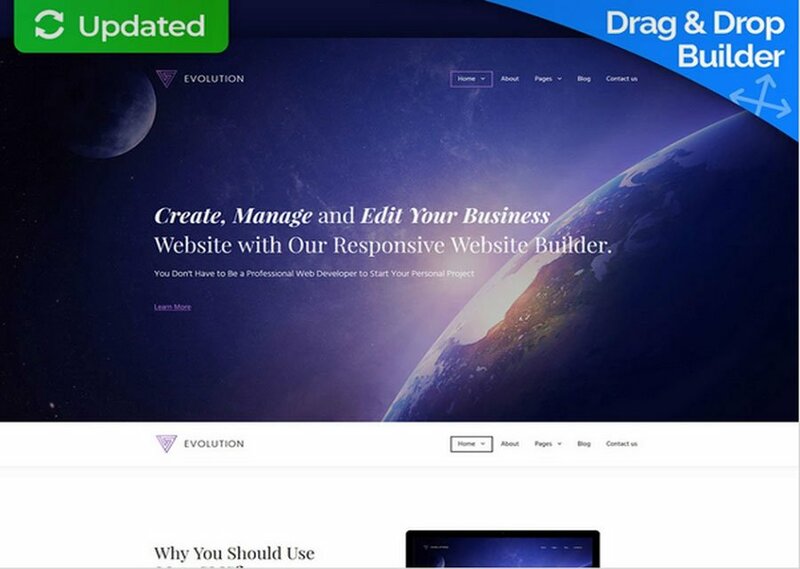 You can also use drag-and-drop editor to customize the site fully. For a beautiful landing page, you may apply influential images or use specific features to impress your visitors. Seomentro was originally designed for fulfilling the needs of SEO agencies. Nevertheless, this template is an excellent choice for other businesses that provide consulting services. It suits both individual consultants and big consulting companies, not depending on the revenue your consulting business. The functionality of Seomentro is enjoyable. It contains the Website Builder which provides control over the layout and the design of the site. As in the best website builder templates, you have all necessary pages pre-created for yours. There is an opportunity to advertise your agency on all the devices because of full responsiveness of the template. 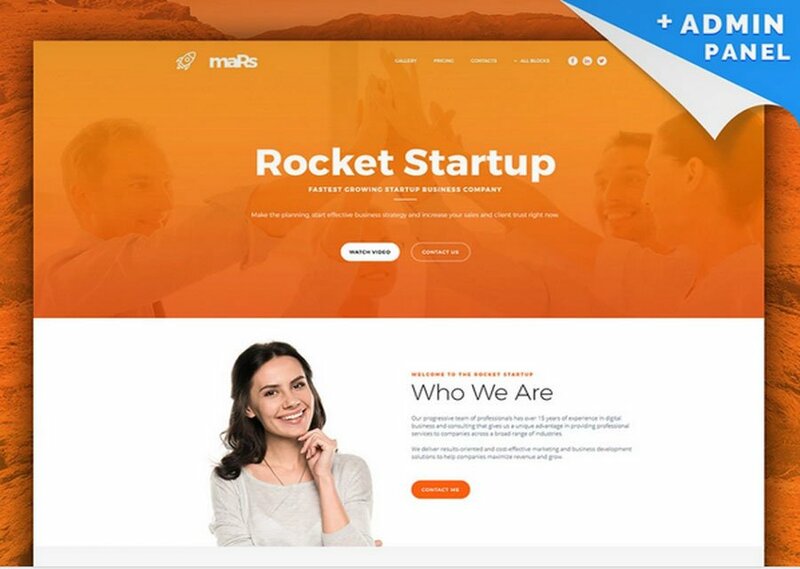 With minimalism on the rise, it’s not a surprise that the best website builder templates have become popular recently. Simplicity and elegance are characteristic for them. At the same time, the focus of attention remains on the valuable content. J. Trudeau is a template designed with this style. It can be applied in creating versatile attractive websites with little effort due to the included drag&drop builder and necessary widgets. 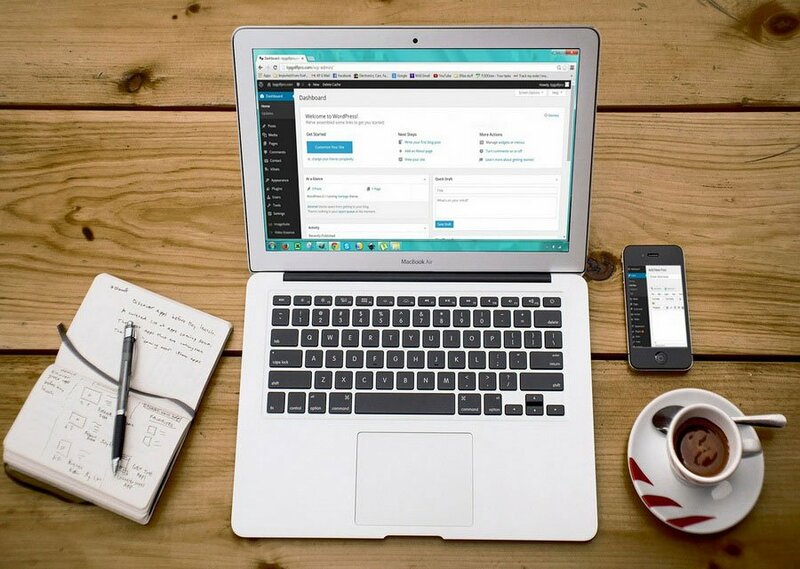 There is also a possibility of starting blogging on your site. The template is fully responsive and looks equally great on different screens. Make your website with this Website Design for Real Estate Company. It has a professional design, fast speed of loading. There is an integrated web building platform with the help of which you can customize your website. 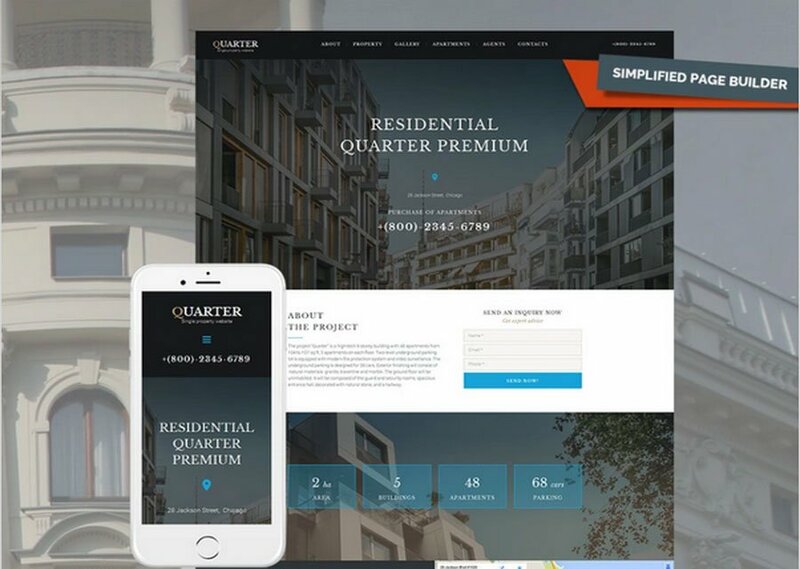 Due to a simple page builder in the admin panel, there is an opportunity to make a website for your real estate business even not having any programming skills. You can construct your website by tweaking your favorite blocks on the layout and assemble your website in just a couple of clicks. Try to build your website right now by signing up for the free trial period. If you like the final result, you can buy your template with all modifications after the end of the trial. There are lots of photographic themes available, but it can still be hard to find a really quality option for videos. However, this one suits the purpose. It offers a simple way of customization due to the website builder. You needn’t spend much time or effort on creating an impressive site being a videographer or a vlogger. This template enables you to create a website with a minimalistic and functional design. It contains ready-made designed blocks. This one also offers various widgets such as contact form, video widget, and social integration. Each widget and module is included with the specific niche of video content in mind, so you can present your content to the audience. If your company provides original ideas in architecture, renovation, and reparation, you can share your projects on the site. It can be created based on one of the best website builder templates – Remodeling Website Template. This theme was produced for your business to become noticeable for your clients. It will also influence competitiveness. You can easily remake the original website structure because of the comprehensible admin panel. The website builder with drag & drop functionality is user-friendly and requires no coding skills. Different tools and widgets in it can help you to implement the necessary functions of your website. there is an opportunity to try this web design in the free live demo version for 14 days. This one is another worthy contestant in the collection of the best website builder templates. It is a landing page template that you can use to build a functional website on one page. A theme is a superb option for digital marketing and SEO agency. You may even customize classy pre-made pages with a website builder to create an outstanding site. Due to the 100% responsiveness, it will look qualitative and eye-catching on any device despite the size and resolution of its screen. As a web agency, you can easily assess the quality of web products. Then have a look at this Web Design Agency template. 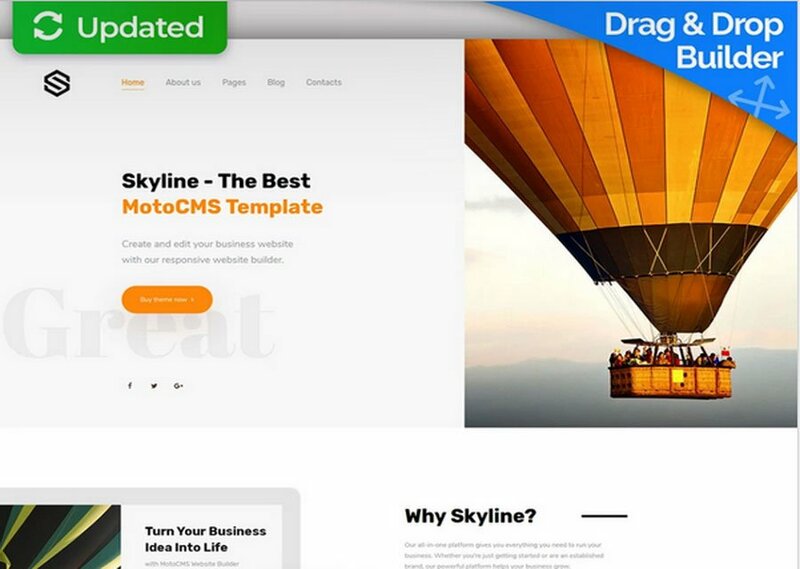 This template allows you to customize your website in no time, due to the Drag-and-Drop Website Creator. Furthermore, the original design of the pre-made pages of this web design agencies template corresponds the latest trends and looks stylish. After all, you can add all the needed changes in a couple of clicks. Your prospective clients will have the best impression of the site. Due to the 100% responsivity and the SEO-optimization tools you can be sure that your site will be available to your clients fast and in full quality. This template is responsive and minimal. 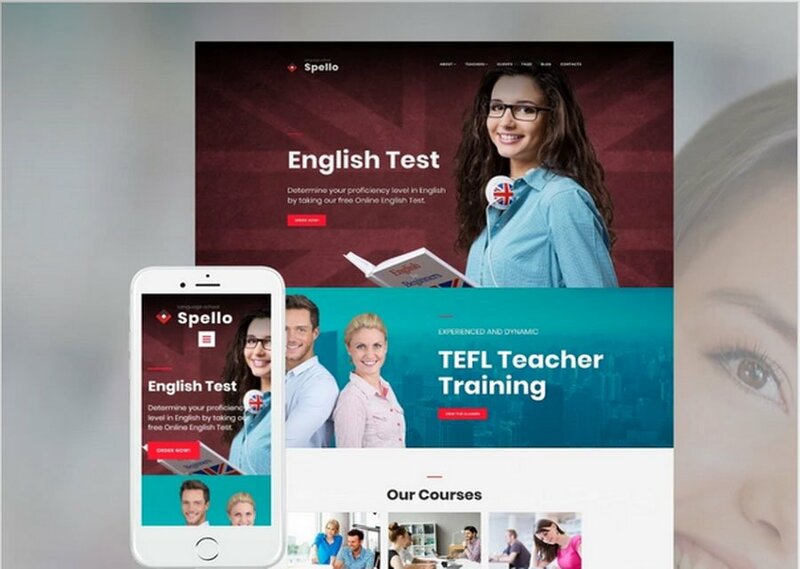 It can help you turn your language school’s presentation into a beautiful website worthy of envy. It has a professional uncluttered look. 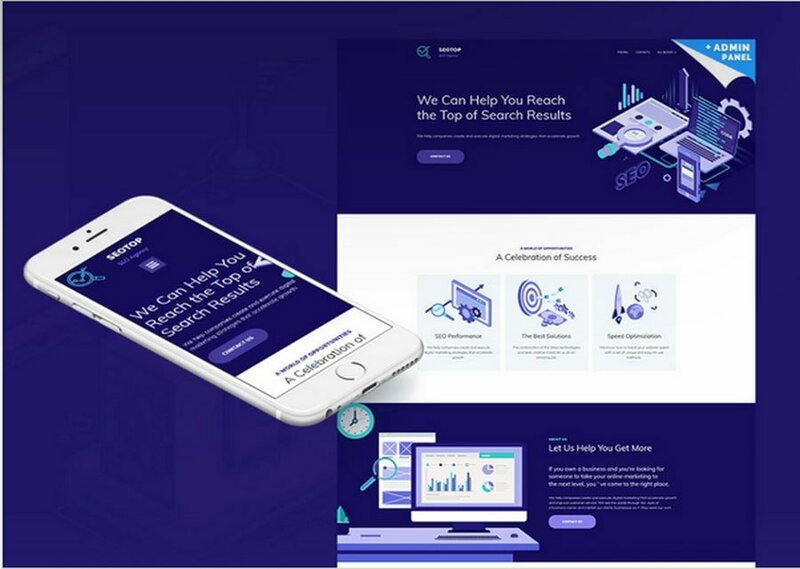 Best website builder templates are customizable, so this one will also let you create a site that’s well-designed up to your liking. This theme is a great option for English Language Center, because it includes audio and video widgets, a Google map widget, and blog functionality for sharing latest news and post articles on learning English. They all can optimize your company’s website. In addition, this free theme is responsive. 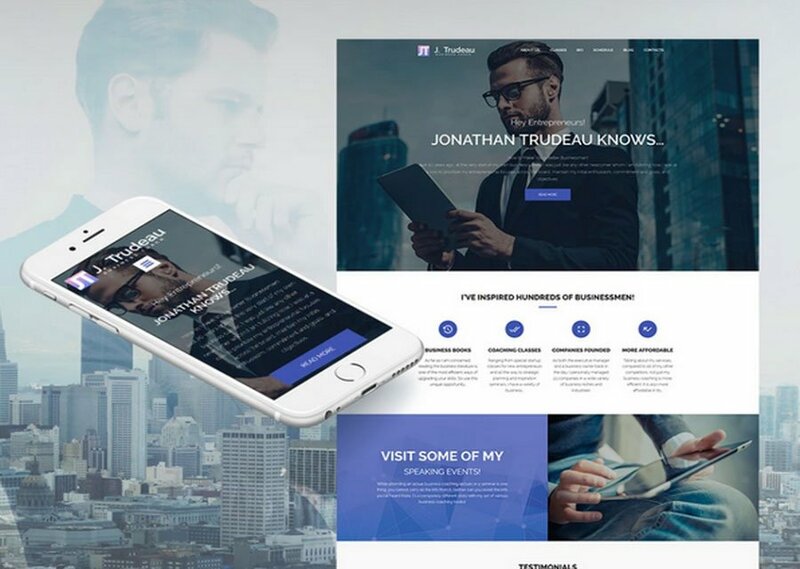 Graphonex is one of the best website builder templates and has premium quality. Its stylish design can be fast customized, which saves your time and effort, especially if the deadline is soon. It is equipped with multiple widgets and modules that make it stand out on the market. First of all, it contains the Website Builder. It is made to ease the process of finding and creating the most suitable layout for your future site. Moreover, there is a powerful Color Picker in this template. Because of this tool, you get five colors that dominate the color palette of your website. If then you need to change one color, the whole website can be redesigned in a couple of clicks! Finally, Graphonex is 100% responsive and SEO-friendly. 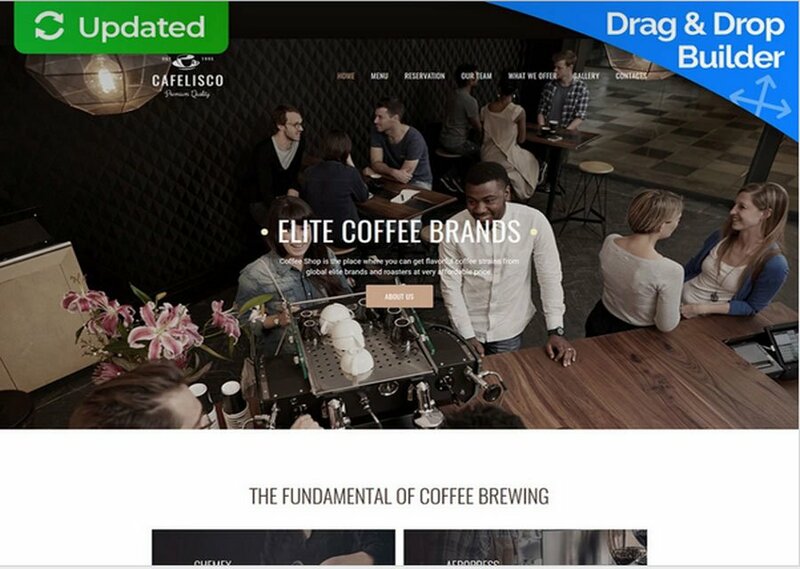 Cafelisco is one of the website builder templates you need to launch to represent your cafe, diner, or cafeteria online. If you are sure that eating out is a whole new culture, then this template will suit you. It contains necessary tools. First of all, there is a manageable drag-and-drop Website Creator which will help you organize the layout of your website properly. It is also possible to customize pages to make the image of your cafe individual. You are able to move and change all the elements according to your taste in a moment to create the atmosphere of your unique place. Secondly, you can use social media widgets on your website to inform your customers about a menu, special offers, and bookings via various social accounts. With Cafelisco it is easy to keep in touch with your clients and make your connection personal. 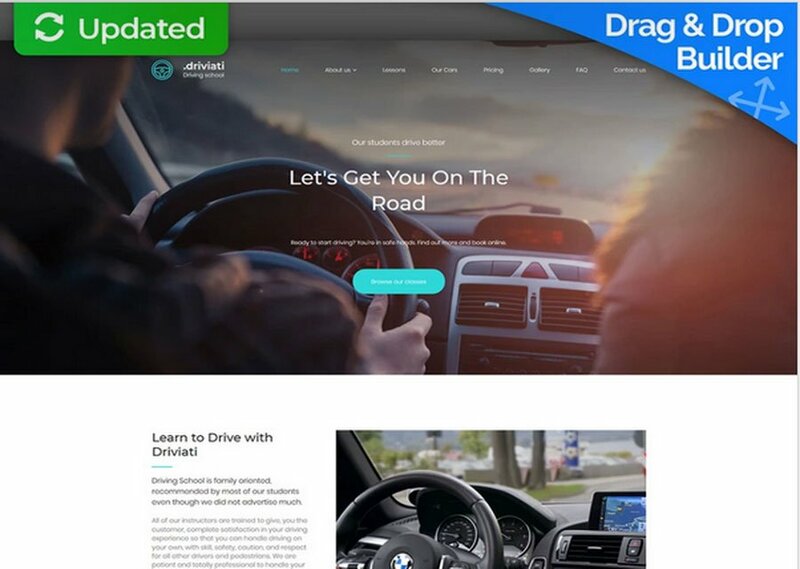 Specifically designed for driving schools, this website design includes many amazing features which facilitate the process of launching a website. Its widgets contain the Color Picker, due to which you can work out the dominant colors of your website without a doubt. Website creator can be a powerful tool in case you want to create a website in a few days or change your website design and save valuable business time. It is also equipped with a powerful video widget. It will let you share video lectures on driving with your clients. Besides, a pre-made contact form makes it more convenient for your customers to register and get access to some materials you offer. If you need an accessible and reliable industrial site, have a look at the Gaspero. 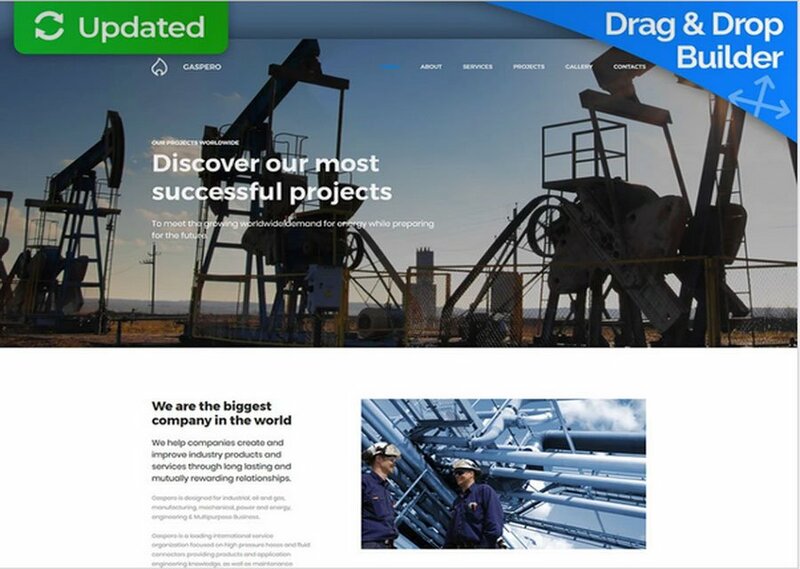 It was initially created for oil and gas companies, but know this template stands out of the row of the other website creator templates. Gaspero is responsive and SEO-oriented so it will improve the results for your company. Your target market will get informed about your service faster. 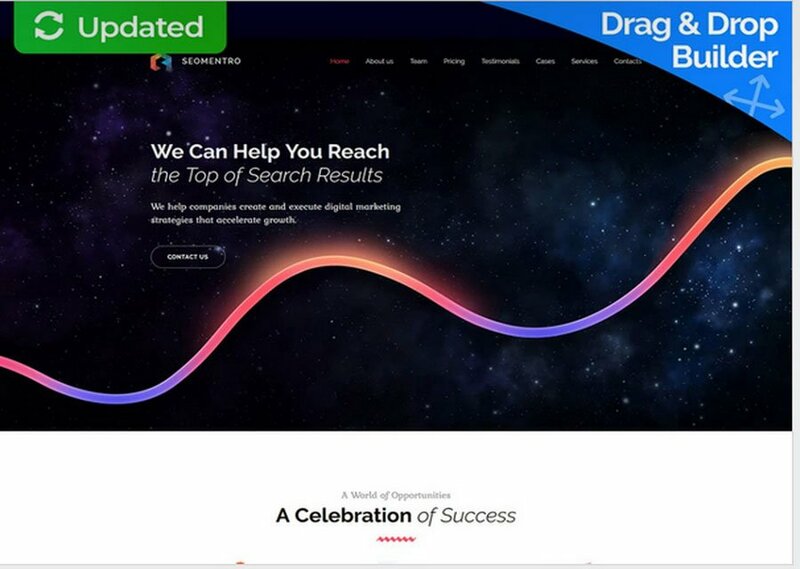 The understandable drag-and-drop Website Creator can help start and update your website without any trouble. The pre-made designed is made for a serious player on the energy market. However, this industrial template is easily customizable too. You can change as many elements as you need and whenever you feel the need for changes. 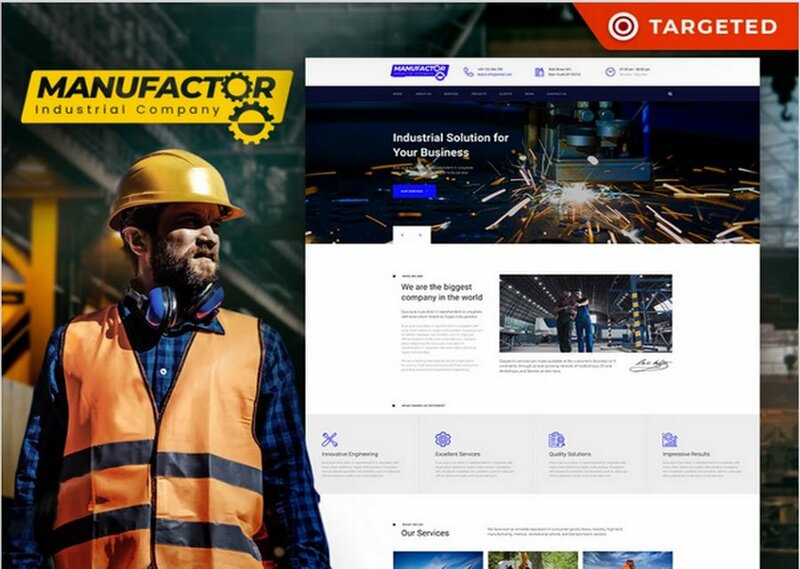 ManuFactor is a powerful industrial and manufacturing companies website template. 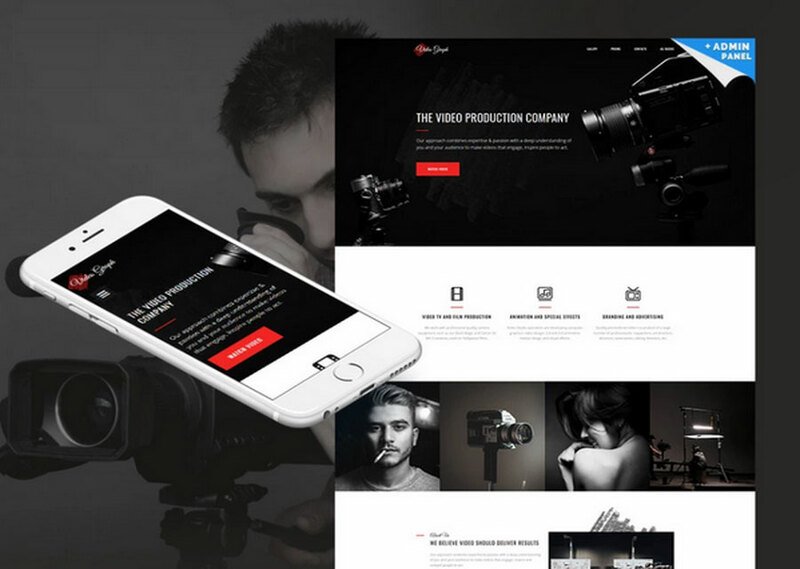 Being editable and multipurpose it becomes one of the best website builder templates. This template contains 4 pre-designed homepage layouts devoted to Chemical Industry, Plastic manufacturing, and Textile Industry. The manufacturing design has a well-balanced layout. You can modify every page and element applying the intuitive drag-and-drop builder. Such a template is usable and informative. The manufacturer website template includes several widgets. You can choose from the list, grid, carousel or creative project showcase options. ManuFactor website template is also 100% responsive, SEO-friendly, and cross-browser compatible. If you need a theme packed with premium features, then Oristi should top your list. It has custom widgets, a drag-and-drop page builder, and a built-in portfolio. This unique template offers many pre-built pages. You also have the option to change and build your own site to your liking with multiple ready-made blocks and promote it wisely. This template with such an exquisite responsive design can fully highlight your work. Moreover, you don’t need to write a single line of a code because of the website builder and a comprehensible admin panel. Modern meets traditional in one of the best website builder templates. Photorx has a high level of flexibility because it is customizable. Although it looks very professional, it’s a great beginner theme for starting your first photographer portfolio website. You can choose from pre-built blocks or add to them some individual design using a website creator. This theme comes with social integration options so your visitors can connect with you across your social media accounts. This is a stunning and elegant responsive template. It’s best suited for lingerie, clothing, or fashion blogs due to its stylish design and presentation. You can still use it for many other purposes too. The website template has inbuilt widgets: social media integration, audio, and video widgets. This will let your clients join your social media circle, increasing your online influence. 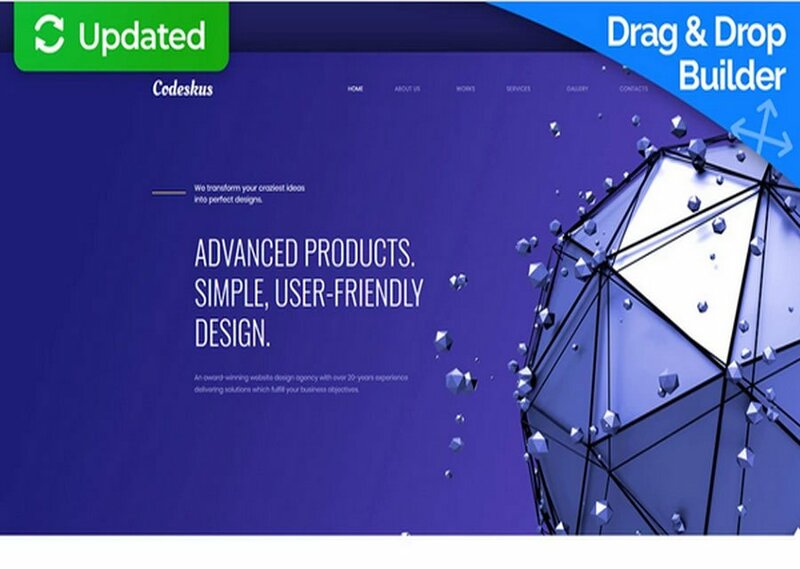 This template contains all the necessary features for a modern website. Zoe is one of the best website builder templates. It is a tasteful breakthrough in the sphere of fashion sites. It has a beautiful layout and more than 15 pre-made pages. This fashion theme is equipped with Drag-and-Drop Website Builder. Due to this builder, you save the time on launching the site . Then managing and remaking Zoe theme is more than easy. You will quickly fill your product catalog and customize every site element. It can be tested during a free 14-day trial. 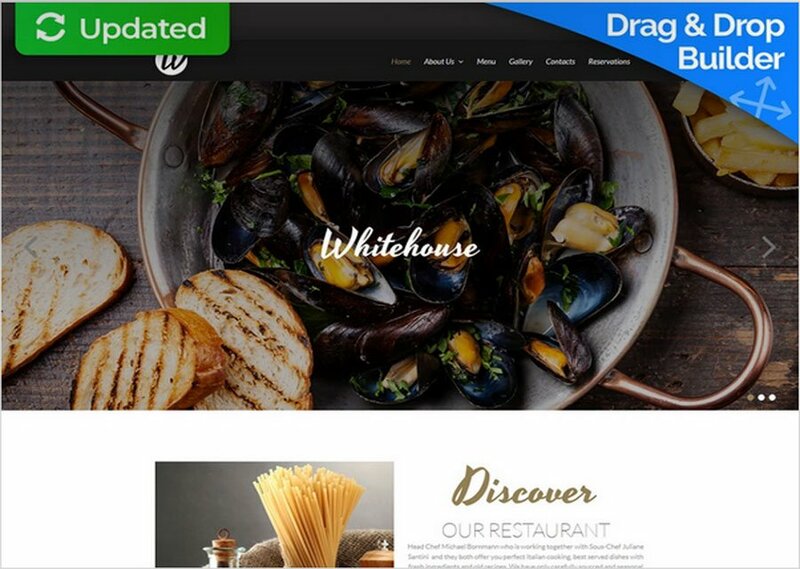 Responsive restaurant website template is made with the idea to increase the popularity of your restaurant or cafe. The design is pleasant and creates a good association with your place because of the black and white color mixture of fonts and patterns. 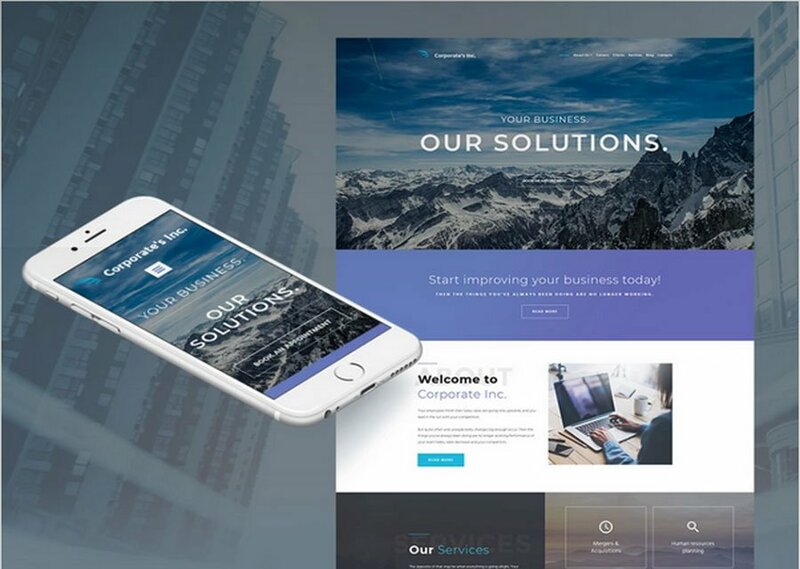 One of the website builder templates will motivate visitors by including mind-blowing images, and a stunning slider below the header and the menu bar. It is also fully responsive so pictures and sliders will not lose quality on the other type of the screen. The template is equipped with reservation functionality and ordering options for the comfort of your clients. Nowadays, it is getting more popular to arrange a video session instead of a photo one. And it’s important for such companies and producers to know how to represent themselves online. 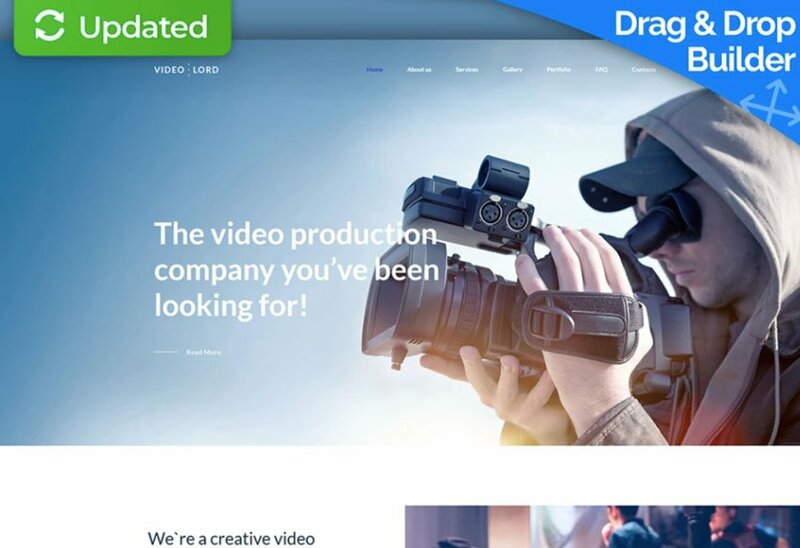 So, here’s a nice choice for them – the eye-catching website template for a video production studio. It is equipped with a powerful Drag&Drop Creator and a user-friendly media library. All you need to make a unique and recognizable website! The best website builder templates are effective and provide you with all of the necessary features. Once you pick the right template, you get a website creator which helps you to launch a website of your dreams in no time. In this post, we’ve highlighted important tips to consider while selecting a quality template for your site and showed forty of the best website builder templates to choose from. They include premium and free themes, landing page, and even eСommerce themes. The options available are multiple so you can create any type of site you want. Which of the above templates do you prefer? Let us know in the comments section below! Kushan is a Linux geek who worked on countless web development projects. He's well seasoned in handling both the back-end and the front-end. When he has free time, Kushan likes to hike and enjoy the beauty of nature.